Circa 2011, I saw Tony Robbins TED Talk and it inspired me to one day have a TED Talk of my own. In 2013 when I went to the Visionary Painting Intensive at CoSM with Alex and Allyson Grey, I had the chance to speak with Alex about his TEDx Talk, "How Art Evolves Consciousness" and after seeing me present a 15 minute talk/slideshow about my work, he offered me enough positive feedback about my abilities as a storyteller to keep the idea simmering on my back burner until this year. I wanted to apply to speak at last year's event but was immersed in yoga teacher training and decided to hold off applying until this year - and almost missed it! When I remembered to look for the application, I was lucky enough that they'd extended the deadline - but it still only gave me days to apply. 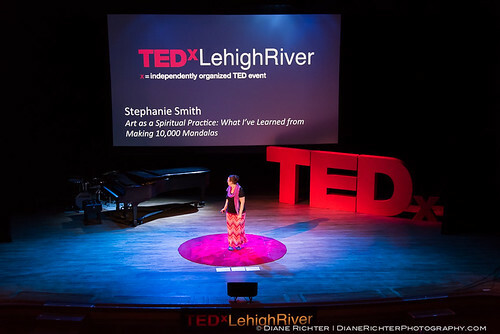 I applied and less than a week later, was one of 8 speaker candidates selected to attend TEDxLehighRiver's first ever "School" and had the opportunity to be expertly mentored to develop my talk. My topic? 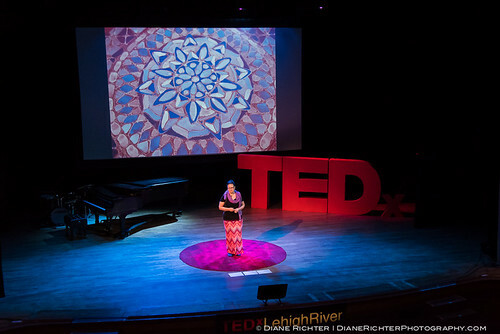 "Art as a Spiritual Practice: What I learned from making 10,000 mandalas." 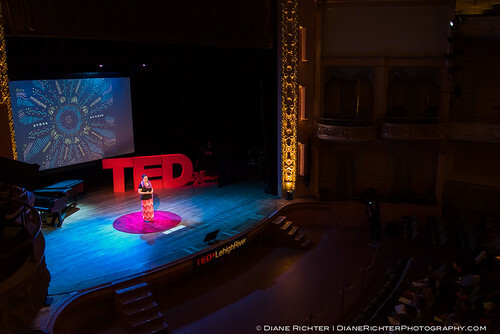 It was exactly 80 days from the day I applied until I gave my talk in front of several hundred people at Miller Symphony Hall in Allentown, PA.
For what it's worth, this was one of the most difficult things I've ever done. 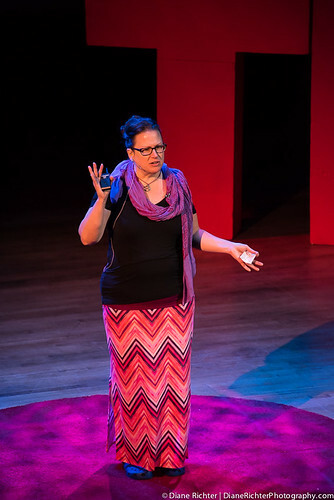 While I love teaching and public speaking, TED Talks are structured much differently because they are meant to be conversational while focusing on only one idea. Everything in your talk must support just one idea - and that's super tough! Especially if you want to talk about subjects that are deeply personal - like art... and spirituality... LOL. It required me to do a monumental amount of soul searching to be clear about who I am, what I believe, and why I do what I do. 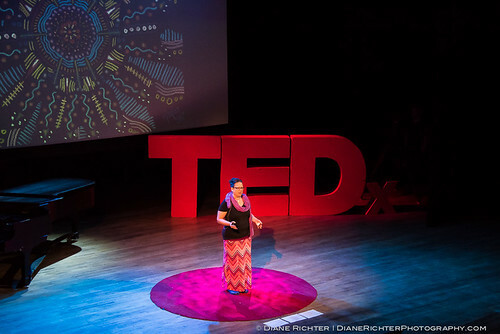 And then there was the memorization... TED talks don't have to be memorized verbatim - but you do need to know the material well enough to be able to speak about it - whether memorized, working from bullet points, or improvised. Now the funny thing is, in my talk I encourage people to not be so hard on themselves about the quality of their efforts when the goal is personal growth. But I still was beating myself up to try and deliver a flawless talk despite knowing full well I could only do my best in that final moment on the round rug. I read my talk at least a hundred times. I probably spoke it at least a hundred times. (my poor husband...) I recorded it and listened to it, and I wrote it out several times by hand in an attempt to internalize the material. Keeping in mind, it's not like I don't know the content. What was worrying me, was if I would have missed something that was crucial to another part being understood. I was the only speaker out of the 8 that didn't use a lot of slides throughout my talk - because in my mind, I just wanted to talk. 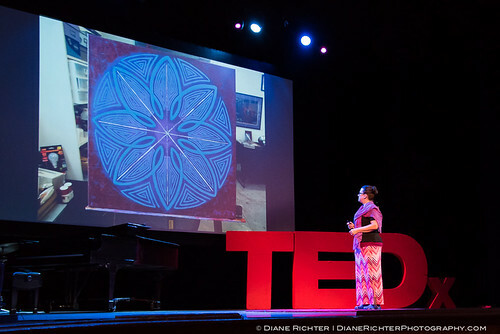 I used a single image for most of my presentation, and then at the end, I showed a 44 second clip which showed a rapid fire montage of 120 different pieces of the mandala art I've created over the years. So how did I do? I did my very best. Was it perfect? Hell no. But you know what? 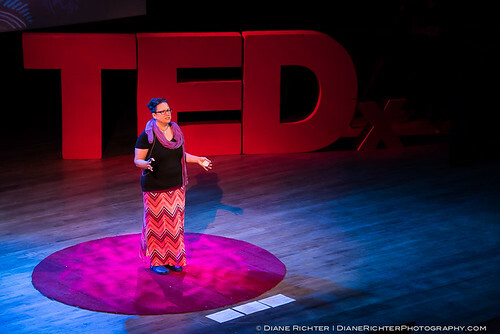 The speaker isn't supposed to be the hero in a TED Talk. The idea is the hero. As soon as the talk is published online, I'll let you be the judge. That is outstanding. Make sure to post a link to the video when it's up!